A reservoir is the artificial body of water that forms adjacent to a storage dam. Many of the modern reservoirs that operate today in unison with dams serve two or more purposes. The most common purposes of these reservoirs are to generate hydroelectric power, provide flood control, store water, enable irrigation, and provide recreational opportunities. When a reservoir functions in such varied ways, it is called a multipurpose reservoir. Many multipurpose reservoirs possess mission statements that express exactly what purposes it can and cannot pursue. For example, the U.S. government expressly stated that the purposes of the Lake Mead reservoir, formed when Hoover Dam was constructed between Arizona and Nevada, was that of "flood control; improvement of navigation and regulation of the Colorado River; storage and delivery of Colorado River waters for reclamation of public lands and other beneficial uses exclusively within the United States; and hydroelectric power production." Smaller reservoirs also can serve multiple purposes. For example, the Apalachia Reservoir is a small, deep, cool-water lake set among the mountains of western North Carolina. It was built primarily to generate hydropower. The reservoir, which is next to the Nantahala National Forest, also provides a scenic site for fishing, canoeing, hiking, rafting, and primitive camping. Smallmouth bass, spotted bass, redbreast sunfish, and white bass are often caught in the reservoir and in waters downstream of the dam. 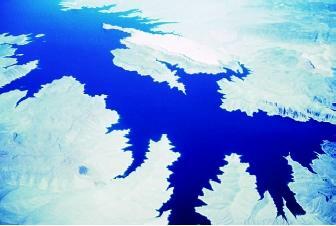 Lake Mead is a multipurpose reservoir formed by Hoover Dam (1936). The Lake Mead National Recreation Area (LMNRA), which stretches about 230 kilometers (140 miles) along the Colorado River and includes Lake Mead and Lake Mohave, was the first national recreation area established (in 1964) by the U.S. Congress. This aerial photograph shows Lake Mead and some of the land included within the LMNRA. Sometimes when a reservoir serves different functions it is nearly impossible to operate each function at its maximum level. For example, a reservoir that provides irrigation, power generation, flood control, and recreation may place conflicting demands on its users. An electric power company needs water from a hydropower reservoir to be released throughout the year in order to provide its customers with a steady source of electricity. On the other hand, a farmer who needs water to irrigate crops wants water to be released from the reservoir only during the growing season, and only when dry conditions are present. Forming a reservoir behind a dam changes the ecology of the reservoir site and its surrounding area, including the area that once was terrestrial. Fish are among the affected wildlife because many species depend on free-flowing waters to live, especially to reproduce. A dam can block the passage of anadromous and catadromous fish. Despite fish ladders and other structures to allow fish a chance to bypass the obstruction, the cumulative effect of multiple dams built along the length of a river can exact a heavy toll on fish populations. * In the Columbia River, for example, which is blocked by a series of dams, migrating salmon populations along its total length can drop by as much as 95 percent. SEE ALSO Army Corps of Engineers, U.S. ; Bureau of Reclamation, U.S. ; Colorado River Basin ; Columbia River Basin ; Conflict and Water ; Dams ; Fish and Wildlife Issues ; Lake Management Issues ; Planning and Management, History of Water Resources ; Recreation ; Salmon Decline and Recovery ; Supply Development ; Tennessee Valley Authority. Neal, Harry Edward. The People's Giant: The Story of TVA. New York: J. Messner,1970. Hoover Dam National Historic Landmark: The Mission Bureau of Reclamation, UnitedStates Department of the Interior. <http://140.216.61.130/index.html> . Tennessee Valley Authority. <http://www.tva.gov> . * See "Salmon Decline and Recovery" for a photograph of a fish ladder.